Social media, if used the right way, can be a valuable tool in your writing arsenal. Using it to your advantage as a writer, takes time and patience to learn. There's certainly plenty of websites, and blog posts all itching to give you the best marketing advice. Former chief evangelist for Apple, Guy Kawasaki, pioneer of business blogging, Tweeting, Facebooking, Tumbling, the list goes on. 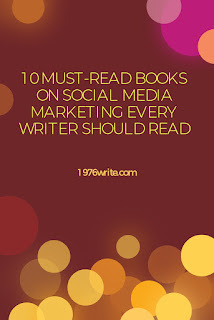 Gives over one hundred practical tips, tricks, and insights, to produce a focused, thorough and compelling presence on the most popular social media platforms. New York Times and Amazon bestseller, Jay Baer offers a new business approach that cuts through the clutter, using marketing that is truly useful. Drawing from examples of companies who are practicing Youtility, as well as experience helping more than seven hundred brands improve their marketing strategy, he offers a groundbreaking plan for using information and helpfulness to transform the relationship between companies and customers. Filled with full-colour images and thought-provoking examples from leading companies. The Power of Visual Storytelling explains how to grow your business and strengthen your brand by leveraging photos, videos, infographics, presentations, and other rich media. This book delivers a powerful road map for getting started, while inspiring new levels of creativity within organisations of all types and sizes. Acclaimed author, educator and marketing consultant Mark Schaefer untangles the world's most confusing business trend in the all-new edition of his classic book. The book provides insights into *The five foundational strategies behind social media success, *A six-step path to discovering your social media strategy. This is your path forward, this is your path explained. One of the leading authorities on Content and Online Marketing, Lee Odden teaches you how to incorporate essential content optimisation and social media engagement principles, thereby increasing your ability to acquire, and engage relevant customers online. One of the most groundbreaking and timeless bestsellers of all time, Dale Carneigie teaches you how to make people like you, twelve ways to win people to your way of thinking, nine ways to change people without arousing resentment, and much much more. Dr Robert Cialdini uses his thirty-five years of rigorous, evidence-based research, along with a three-year long program of study of what moves people to change their behaviour. Resulting in this highly acclaimed book. He teaches you the six universal principles, how to use them to become a skilled persuader, and how to defend yourself against them. From one of the world's leading figures in the world of social media marketing, Likeable Social Media reveals everything you need to know about building your brand, and attracting & retaining loyal customers through smart, savvy social media engagement. New York Times and bestselling author Gary Vaynerchuk shares hard-won advice on how to connect with customers and beat the competition. Vaynerchuk shows that while communication is still key, context matters more than ever. It's not about developing high-quality content, but developing high-quality content perfectly adapted to specific social media platforms and mobile devices. Jeffrey Rohrs chief marketing officer at Yext, a global digital location management leader, shows the days of build it and they will come are long gone. If you're looking for a way to gain a lasting advantage over your competition, look no further, and start building your email, Facebook, Instagram, mobile app, SMS, Twitter, website and YouTube audiences to last.